Can you confirm these amateur observations of Palleon nasus? Type locality: Ekongo, SE Madagascar. pauliani: known form the type locality only; Type locality: Manjarivolo, l’Andringitra, 1620-1650 m elevation. 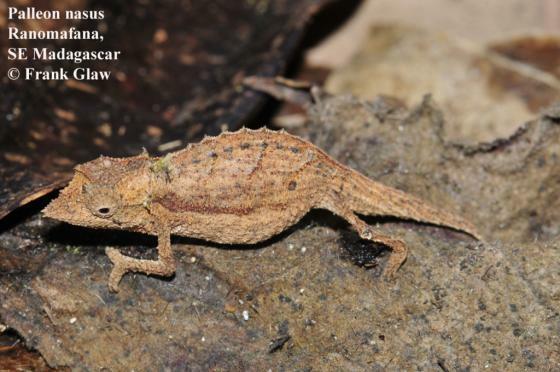 Comment Type species: Brookesia lolontany RAXWORTHY & NUSSBAUM 1995 is the type species of the genus Palleon GLAW et al. 2013. Ahl, E. 1927. Zur Kenntnis der Chamaeleontiden Madagaskars. Zool. Anz. 72: 47-48. Brygoo, E. R. & C. P. Blanc & C. A. Domergue 1972. Notes sur les Brookesia (Chaméléonidés) de Madagascar. VII. Brookesia de l'Andringitra: observations sur B. nasus Boulenger, 1887; description de B.n. pauliani n. subsp. . Bull. Mus. nat. Hist. nat., Paris 42(56): 591-600.